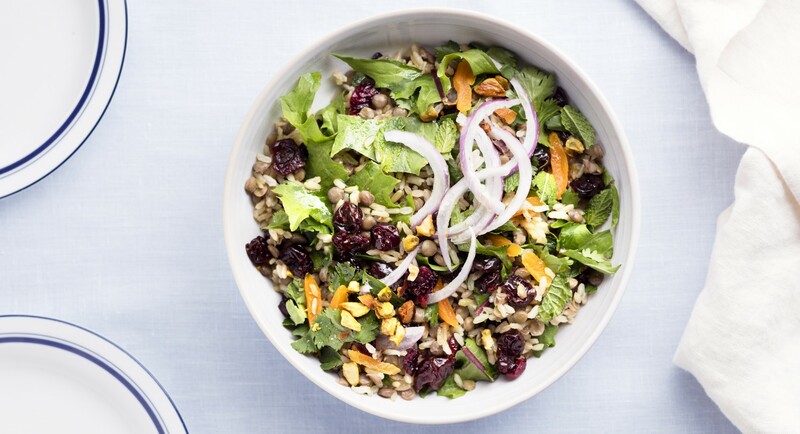 Hot summer nights call for cool, refreshing dishes, like this hearty brown rice and lentil salad. Dried cranberries, apricots, and pistachios add sweet and salty notes, while mint, parsley, and cilantro liven up every bite. Bring it along to a picnic or barbecue or serve it as a vegan main course. Rinse lentils and place in a medium-sized saucepan with 2 1/2 cups of water and garlic. Bring to a boil over medium-high heat, then turn heat down to maintain a low simmer. Cook, uncovered, until tender yet still al dente, about 20 minutes. Strain the lentils and discard the garlic. Combine with brown rice, dried cranberries, dried apricots, parsley, cilantro, mint, red dandelion leaves, pistachios, and red onion in a large bowl. Season with salt and pepper and toss to mix. In a small bowl, whisk together lemon juice, grated garlic, salt, pepper, and olive oil. Pour over salad and toss to coat.